Hi all this is my first post though I have been avidly reading for a long time. I would so appreciate some input on my current project. Here’s a bit of background. We are a farm family of 4 and have been living in our 1920ish farmhouse for 15 years. I expect DH and I will live here until death do us part. 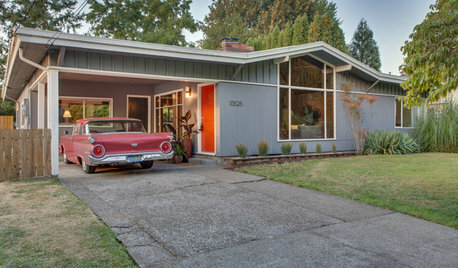 The house has good structural integrity and is well insulated but was properly abused as a rental with cheap interior renovations before our time (think green and white fake paneling in bedrooms, indoor/outdoor carpeting glued over hard maple floors, etc). It still has some beautiful original details like gorgeous shellacked fir molding around five panel doors and the windows. I am just now getting the time and a little budget to begin improvements. I am doing as much as I can myself, learning a ton and enjoying the process. I have access to tools, don’t mind hard work and like to learn but I do not have skills. (DH has no time or interest in any of it but I do have some friends with professional trade skills to help and advise me, one dear one with a wood shop who is just amazing and generous.) Last year I worked on the downstairs, took out a wall, added windows and good lighting, and refinished those lovely maple floors (plug for Rubio Monocoat here! Amazing product). I bask in the loveliness of the result every day. The next job on my list is the main bathroom, upstairs. Here is the challenge. It is pretty nearly a gut job and I have $3500 to work with. We have two girls who will soon be teens and this is our only full bathroom. Fake/faux/synthetic materials (our dreadful green and white paneling for example!) make me sad and natural materials make me happy. I like simple and functional and avoid trends. Despite the fact that it is a farmhouse I do not like “farmhouse” style or anything kitschy or inauthentic but lean toward Scandinavian-ish spaces or at least spaces with good light, natural materials and a form that follows function. I would rather go without or wait/save than put in very low quality materials. We heat the house entirely with a wood stove and live in a northern climate so my splurge would be ditra heat under tile floors. I just took a tile workshop to learn to DIY that part of it, with an electrician to do the last bit of wiring. With an electrician on site already I’d like to improve the lighting as the current dim/dark atmosphere in there also makes me sad. Given the limit on budget how would you proceed? How would you improve the awkwardness of the space without the expense of moving plumbing? What materials would you use? How would you shop for materials? Where would you economize and where would you spend? What would you hire out and what would you do yourself? Despite the scary picture with the section of OSB around the toilet I believe the subfloor is sound but might need leveling. 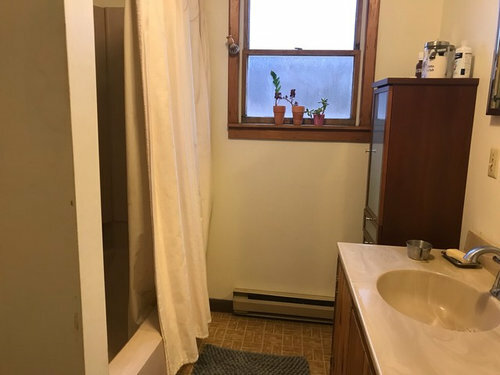 We do need a new toilet and I would like a new bath/shower and vanity but not sure if I should tile around the bath/shower or just give in and buy a new surround. The color of all those things is a sort of buff beige. That awkward wall that contains the plumbing for the tub/shower has some water damage from little kids splashing at it. The room’s footprint is just shy of 70 square feet. Not an expert but With $3500 it might just be nice floors and maybe a new toilet or paint. 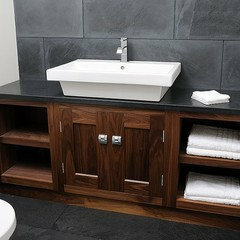 Your existing vanities and towers are ok - You will need that storage and anything new would cost. Do do you have another 3/4 bath or is this where everyone bathes? Is this bathroom just for the girls? I like your vanity cabinet, would keep it. 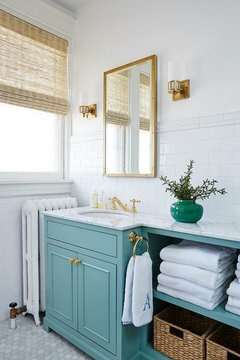 Would paint your two tall cabinets the same color as your walls which IMO would go a long way on improving and making your bathroom more cohesive. 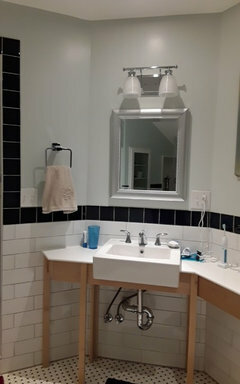 I too have a small bathroom and painted the one tall cabinet I have to match the walls, it looks good, I used Benjamin Moore cabinet paint on the cabinet. My cabinet was unpainted, I would imagine if you go to a paint store they will be able to advise on how to prep your finished cabinets for paint. I admire your initiative and work ethic on doing much of the work yourself, I have a female friend whose DH is like yours, she does all her upgrading too, including tearing down walls! Good luck and keep us posted with pictures! 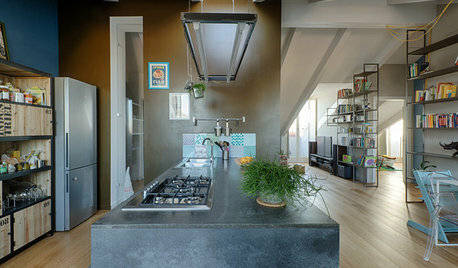 If this were me, I would get a new toilet and tub surround (tile is nice, but not neccessary. With a nice shower curtain closed it can still look nice. And easy to clean!) and tile for the floor. After seeing how much $$ is left (including any cost for labor) I would consider the vanity next. If not enough for a bigger vanity, make a smaller one work with your towers and paint them. And paint the room. 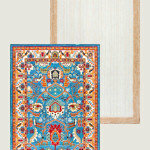 Love your attitude, sounds like you're making your home beautiful. oops, forgot to include lighting you want in there. That's probably were $$ comes in if electrician is needed. 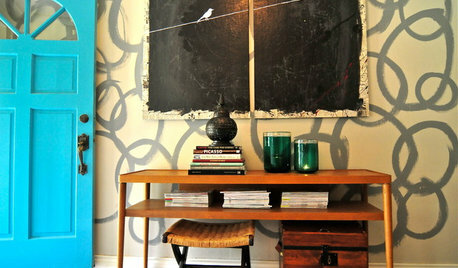 In a old house with unforeseen problems I would paint and decorate and forget a total gut. Do. you have a ReStore in your area? I have found some really good deals on bathroom sinks at my local ReStore. My main floor bath has a Kohler sink which came complete with chrome Kohler faucet for $20 which is a fraction of new price. I found the faucet online for $254 so that was a great find. Does the room have a vent fan? If not, that is step one and I recommend getting the electrician to wire the fan and light to two different switches. If you do the underfloor heating, you could get rid of the baseboard heater and install a combo fan unit that includes a heater as well. I suggest writing the heater to a time switch so it automatically shuts itself off as those can be expensive to run for long periods but great instant heat. I put four 3 inch recessed Led lights in my master bathroom ceiling along with a shower light and a vanity light. Those cans are easy to install in a drywall ceiling but not so easy into plaster so they might not work so well for you. ReStore is also a good source for lighting (new and used) and smaller lots of tile which are probably enough for your room. Ikea is also good value. I would get a new toilet and flooring and paint everything paintable white. Those three updates could be done for less than $3500 and you would be amazed how great your bathroom would look. It would seem like the new flooring is the most critical in terms of improving function and aesthetics. 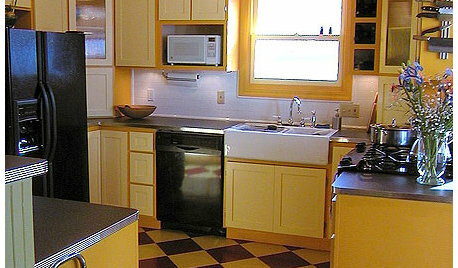 I would get the flooring done to determine how much of your budget is left. Since the electrician will be doing work at that point, you should upgrade your electrical at the same time? Is current electrical GGCI and up to Code. In an older house, it probably isn't. Do you have enough plugs for your family? As others have posted, when you start fiddling around with stuff in an old home, there are invariably undiscovered items that need fixing. If you change the bath tub, you would then likely need to change the plumbing fixtures. Also, since you have only one bathroom for a family DIY projects have a tendency to stretch on longer than if a professional does the job. Paint is a relatively inexpensive fix - a nice shower curtain is an inexpensive upgrade. If you replace the toilet, get one that is well rated that flushes well - especially since it is now going to be a low flow toilet replacing the older model. 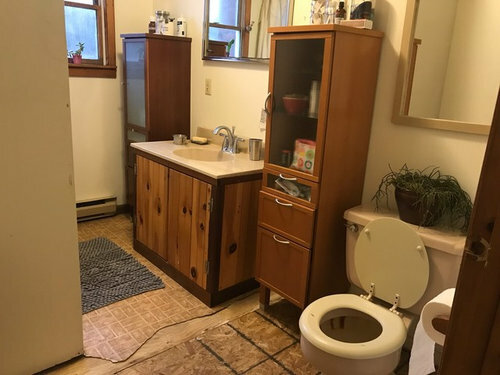 I would think that you would need to have help installing the toilet or hire a plumber or handyman to do it because it is cumbersome even though not technically difficult. Given that you only have one bathroom for your family, it is probably a good idea to get some nice vanity tables for your girls so they don't have to do prolonged grooming rituals in the bathroom. There isn't really any need for most stuff to be done IN the bathroom. Just the electrical will take you darn close to the end of your budget. Do that first, then reassess what is left over. This is going to sound harsh, but for frame of reference, I live in Maine and heat 90% with wood-skip the heat under the tile. That’s a want, not a need. I would deal with the floor. Replace the tub unit with a new one, new toilet, fix subfloor, tile. 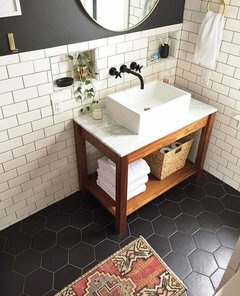 As some one above noted, tile under the vanity so you can replace later. Once I got those things done, I would assess my budget, then save and deal with walls and electrical. Is the tub cast iron with a still-shiny porcelain finish? Would you describe the shower and tub plumbing as good or in need of replacement? Replace the vanity and cabinets with a two-sink vanity such as this Ikea GODMORGON / ODENSVIK. Add inexpensive faucets such as these Ikea Ensen. 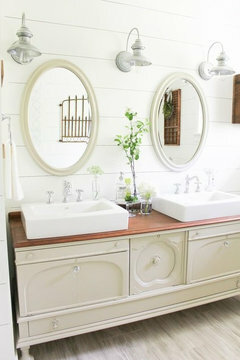 Add a mirror or two above the vanity to span its width; current mirror is too high. The lightswitch above the old vanity would have to be moved because it would be in the way of a mirror mounted lower. 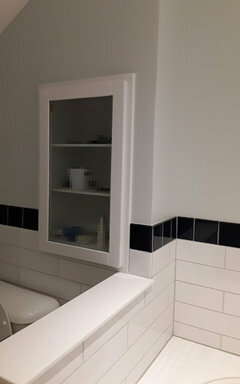 Medicine cabinet(s) could be substituted for mirror(s). The lights aren't shown in your photos. Put one (example) or two (if two mirrors) vanity light(s) over the vanity. Put 4" LED recessed light(s) in the ceiling. If there's a j-box already there that you don't want to mess with, attach a shallow, surface-mount fixture LED light to the j-box instead. Replace the toilet with a Toto Drake plus seat. Remove the mirror over the toilet. You might put a cabinet like this Ikea LILLÅNGEN or a towel rack over the toilet. 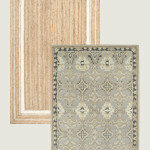 There's lots of porcelain floor tile available for less than $2/square foot (examples). Of course, you'd need backer board, etc. under the tile. Maybe a shower kit could replace the shower. Oh man thank you all for so many thoughtful responses. Makes me feel great to have ideas and advice flowing in. Here are some answers to questions that have come up. Apple pie, that tub is the worst grade old fiberglass thing you can imagine. With fiberglass surround. Plumbing fixtures can be described as, er, not good. The electrical, though, was improved a few years ago, and is in pretty good shape, I believe up to code and is GCFI. I think we have the capacity to add the floor heat in the circuit that currently supplies power to the electric baseboard heater. I know that warm floor is a want, localeater, but it's a strong want (I have lived with chilly toes for a long time! :)) and I would be willing to wait and save up for it to get it done on this pass. I'm figuring if the electrical is sound, and i do the ditre heat install myself, it adds no more than $500? Plus my time. Maybe I'm off on that, I need to run real numbers on it. I should clarify we do have another bathroom in the house, which has toilet, sink and a shower that is currently not functional but could be made functional before this project starts so it won't be quite as bad of a rush as it seems from what I originally wrote. 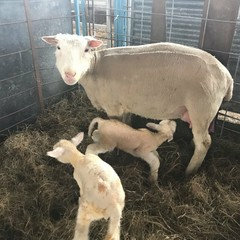 OK will check back later - just heard we have lambs being born, so spring is officially here. Thanks again all. Thanks for info. Sounds like your shower and tub, as well as the plumbing for them, need complete replacement. I'd price out a classic white Kohler or American Standard cast iron tub, the waterproofing and tile (try American Olean or Dal Tile for good moderate price tiles), and the waterproofing and new acrylic surround. 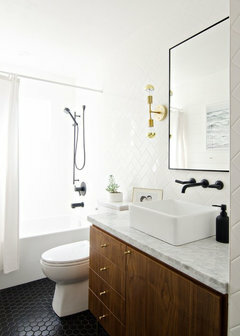 Use Moen's mid priced line of tub and shower fixtures. Moen has excellent quality, fair prices, and unbeatable warranty customer service. Then you'll have numbers to compare and work with. If possible, add an exhaust vent with light over the shower. Getting the other shower to work before starting would be good. A second set of toothbrushes etc. can be kept in college-style totes if the kids end up having to brush their teeth in the kitchen to avoid traffic jams on school mornings. I completely understand the desire to have warm toes. In an old house, you can reserve 20% for contingency, aka, things you find when you open up the wall. Some optimistic people use 10% for contingency. 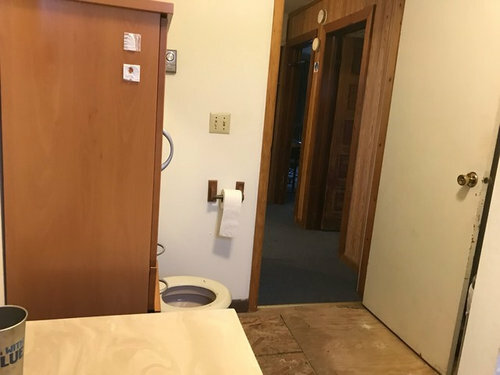 It seems to me that the money would be better spent making the second bathroom usable. The utility of the second bathroom would be crucial during a gut of the main bath, and would almost certainly still be of great use after! Another heater solution would be to replace the current convection baseboard heater with a wall heater containing a fan (example) that would blow warm air into the space. Thank you!!! That put a huge smile on face. So adorable. Hope all is well. Each person should have a drawer (or two, if possible) for personal stuff. 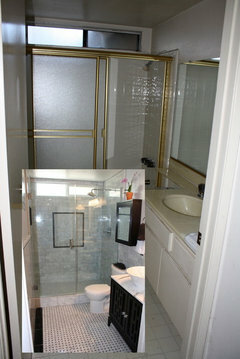 With a low budget, you should consider keeping the fixtures if they are in good condition (tub/shower, toilet and sink). IKEA has come a long way in quality with their bathroom cabinetry. Perhaps the sink/counter combo will fit an IKEA sink cabinet, or get a vanity with a top and sink. A separate drawer cabinet can meet the suggested drawer requirement. An over-sink mirrored medicine cabinet with four shelves can hold small items, leaving the drawers for larger items and other supplies. If the flooring is in poor shape, replace it with good linoleum or luxury vinyl, which is comfortable and not cold for feet, and relatively easy or inexpensive to have installed. DH must have a good idea of what a prize he has in you, DW.....ability and willingness to tackle these things on your own, with some outside help, is rare. Bravo!! felizlady LOL at today's lifestyle. 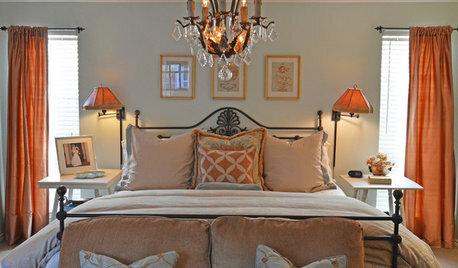 When growing up we were four girls in one small bedroom with double bunk beds which my father built and were beautifully finished, Mom and Dad in the second bedroom, ONE small bathroom for the 6 of us. We were happy, healthy, educated, and active, and continue to be so! NY Farmhouse, it's great that you have DIY skills and a wood shop friend! 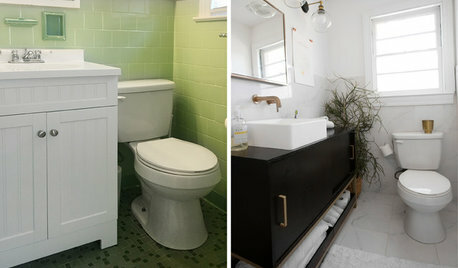 Yes you can completely redo that bathroom on your budget. Yes you have to know how to shop and score on deals. Like, really score. 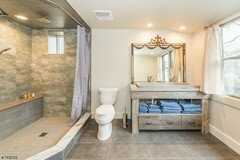 I redid a builder basic bathroom years back on a house we flipped. took it down to the studs. I did all the tiling (carrara marble I found on craigslist for about $3 a sq ft!) I found a mid century chest and made it into a vanity. found clearance items (sink, marble remnant countertop, cabinet over the toilet, etc) on everything in that room. Biggest splurge was the glass shower doors. 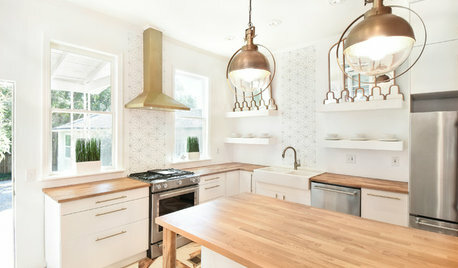 total budget was under 3500.
here are some ideas since you like the farmhouse type of look. do the walls in shiplap or rip your own boards out of sheet plywood. have your friend make you a double vanity for your girls. (or get one large sink) he can also make a matching cabinet if you need one. 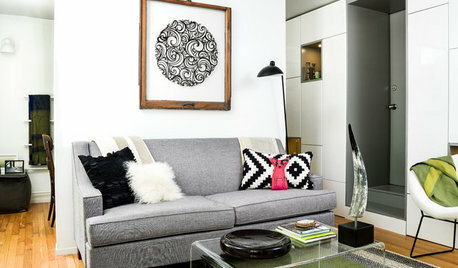 to save space, try to recess the linen tower into the wall and add a door. or do cubbies. 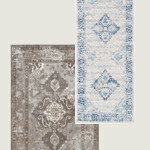 if you want to replace your floors, look for close out deals on tiles. always try to get a better deal by offering to pay in cash. Go to a tile store and see if they have small, left over lots. (look online for the same). check craigslist. People often overbuy and can't return leftover tile. Barter. lighting,,,,Lampsplusopenbox. 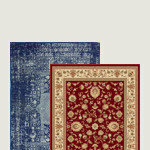 super deals on there. 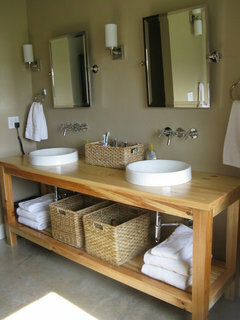 you can buy a single, plain vanity like this, and have your friend 'add onto it" for storage. Paint. Go to an actual stone fabricators shop and see what leftovers he's tossing in the trash. make an offer and see if he will cut it to fit your vanity. totally doable for you. 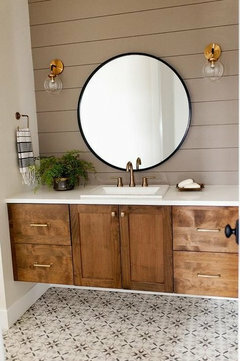 make the vanity (see below), paint it, make the mirror, find a remnant countertop, and tile. the white subways are cheap. ditto ceramic floor. simple to make and can be painted. show your wood friend these vanities. make them with a nice, paintable-grade plywood. Prime and paint. keep a lookout for remnant tops. or, make your own wood butcher block countertop and seal w/something like Waterlox. 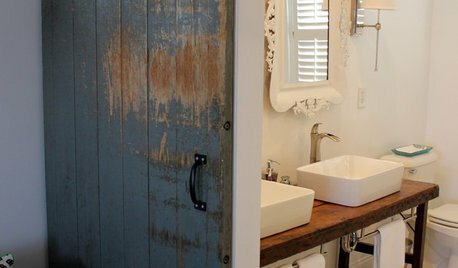 another option is to find an old piece of furniture and repurpose it for your vanity. for $100 bucks, you could easily find one like this and paint it. the lights can be found at Home Depot for $20 each. spray paint them in a nice spray enamel. shiplap walls (or do a headboard). Wow, great ideas! How will you choose? This is my low budget master bathroom vanity. The only item that was full price was the sink at $155 and the trim paint. Everything else came from ReStore or an online auction site which sells store returns. The trim tile, vanity light, countertops and maple for console came from ReStore, as did the storage cabinet, door front and hinges. The mirror, faucet and towel holder were from the online auction. The reclaimed items added up to around $100 so this part of the space was about $250. If you keep an eye out for bargains, you can keep the costs down quite a bit. I paid $15 for the light fixture and stashed it until I needed it. I bought a box of bathroom hardware for about $20, maybe $25, and got the towel ring, toilet paper holder, towel hook in the shower, and still had enough items for the main floor bath. The mirror only cost me $2 because the finish was damaged so I found a can of spray paint and hid that issue. I am not a person who needs my space to be absolutely perfect. It is practical and I am quite happy even if the little details don't quite match. My tub filler is a higher end faucet I found online which was a store model. There is a small mark on the spout and the finish is polished nickel, not chrome. It is 3 feet from the sink and a close enough match for me. The countertops, top and front of pony wall, shower seat, threshold and niche are all cut from Corian salvaged from old kitchen countertops (free!). 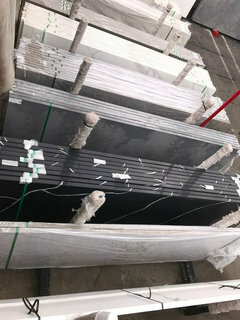 It is an easy material to work with and doesn't require special tools like quartz or granite. Ordinary carbide saw blades and router bits work just fine and you can attach cutting guides with a quick line of hot glue. This is so great. Thanks for all the good ideas and sources. The pictures are really helpful and inspiring. And specific suggestions about brands with a good price-to-quality ratio (like the Moen etc suggestions, Apple Pie) are extremely helpful. I appreciate you all sharing your experience and wisdom. -We have a ReStore about an hour away. I did some scouting there a couple weeks ago, and while I came away with nothing except some paint on that trip I do see the potential! And I need to carve out a day to go to Ikea. I suspect that is where I'll get the vanity. I'll keep checking craigslist for materials too. -I did consider a claw foot tub - we even have one on the farm that is in pretty good shape - but came to the same conclusion as Beth H. It's just not practical enough to be the main washing place for our very dirty family. -I find this really helpful as a prime directive @tartanmeup "You spend on the bones of the space (electricity and plumbing upgrades, toilet and shower waterproofing) and skimp on tile, decor and anything that can be easily replaced down the road (e.g. vanity)." That helps me prioritize. 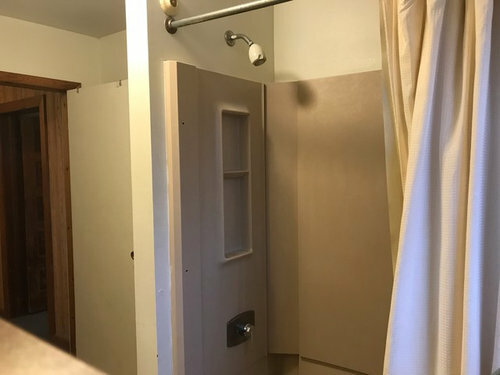 -Next steps will be getting the second bathroom's shower functional, getting an estimate from our electrician, then making a real budget and timeline. The next few weeks are going to be absolutely nutty with lambing but I can make lists and do research as I patrol the ewes. I'm feeling inspired and optimistic that I can get this done before summer. That's when the toilet will start sweating and dripping large amounts of water onto the OSB... so that's a good deadline. -I meant to mention that one advantage I have is access to inexpensive labor for rough framing, demo, etc. when I can't manage it on my own. We have an Amish community here, and the teenage boys like to work away from their own farms when they can. Their hourly rate is low and they are handy and hard-working, though I have learned from experience that they are not my go-to for finish work, drywall, or anything fussy and can't always be relied on for jobs that need to be done in a timely manner - if there's a barn raising or a wedding they just don't show up. But on a pure muscle-to-dollar scale they have been amazing. Many thanks to you all. I'll keep you updated. Agree on the heated floors- well worth the money - if you do dyi make sure to get the tester to ensure you dont finish the floor to find the system was disconnected somehow. Help? Master Bathroom, design challenge, budget remodel?